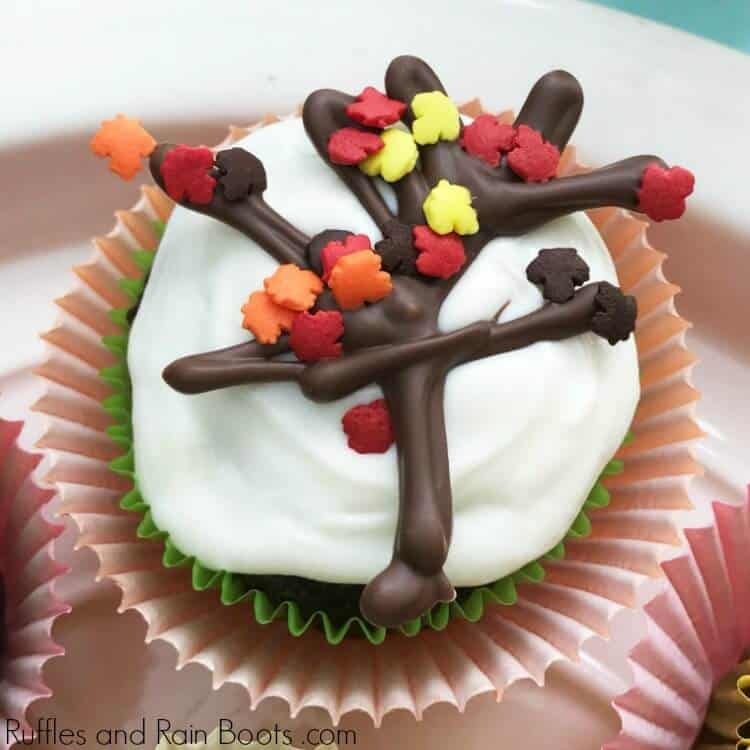 Make these fun fall tree cupcakes for a class or harvest party. 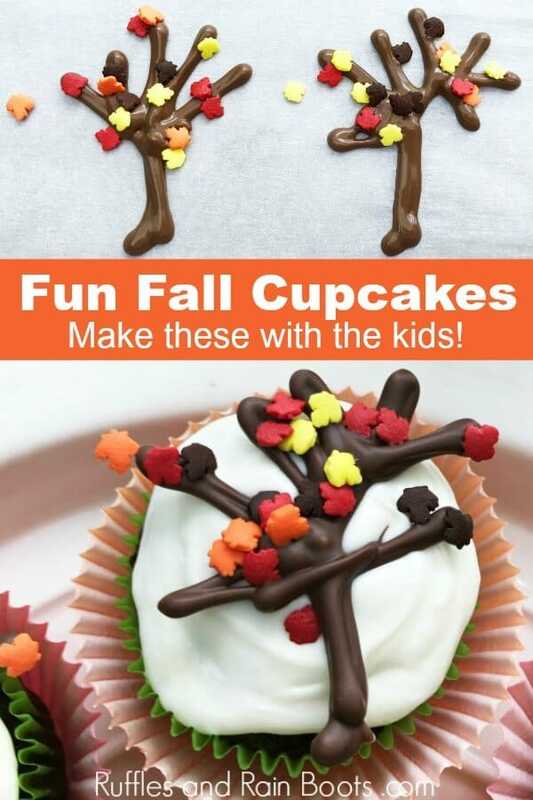 Click through to see how easy these Autumn treats are to make! 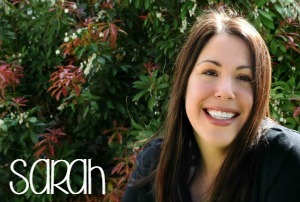 We love to make simple and fun food here on Ruffles and Rain Boots. 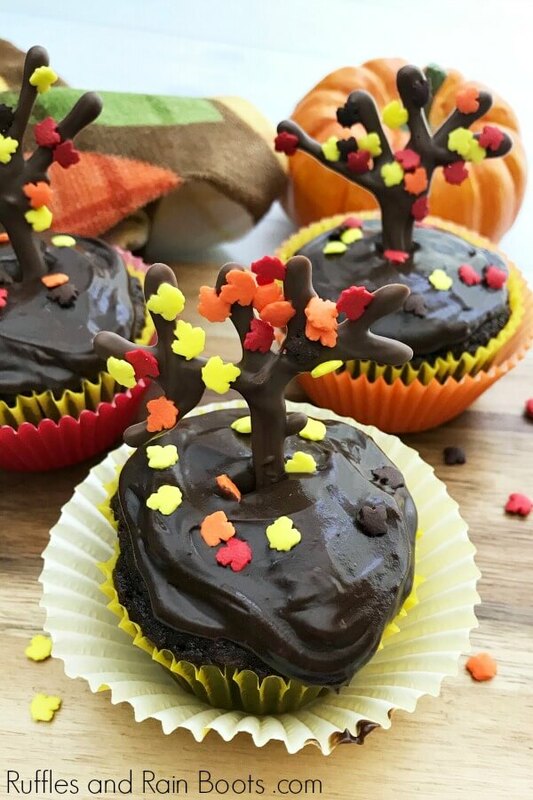 These easy Fall tree cupcakes are just the thing for a Harvest Party celebration, a class birthday during Autumn, or just because you want to make something pretty. This recipe yields 12 cupcakes. Microwave the candy melts per the package instructions and place into a decorating or small plastic bag. Snip off the corner of the bag and squeeze the chocolate onto the parchment paper forming the outline of a tree with small branches. Be sure not to make the trees much taller than 2 inches otherwise they might topple over on the cupcakes. Also, take note to make the tree trunks thick so they’re sturdy. 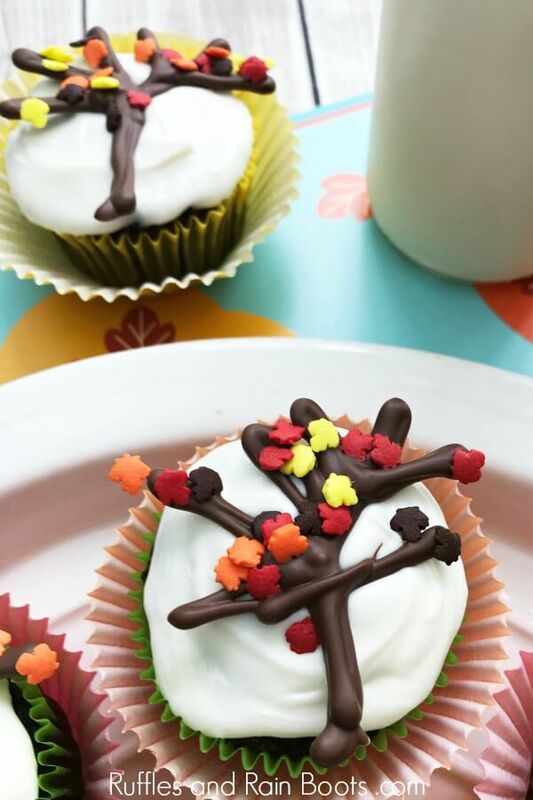 Once the tree has been piped, sprinkle Fall leaves onto the chocolate (while still wet). Make between 20-24 trees (a couple will break during assembly). Allow the trees to set (~30 minutes). You can put them in the refrigerator for 15 minutes to cool faster. Bake and cool the cupcakes completely. While they are baking, line a large baking sheet with parchment paper. 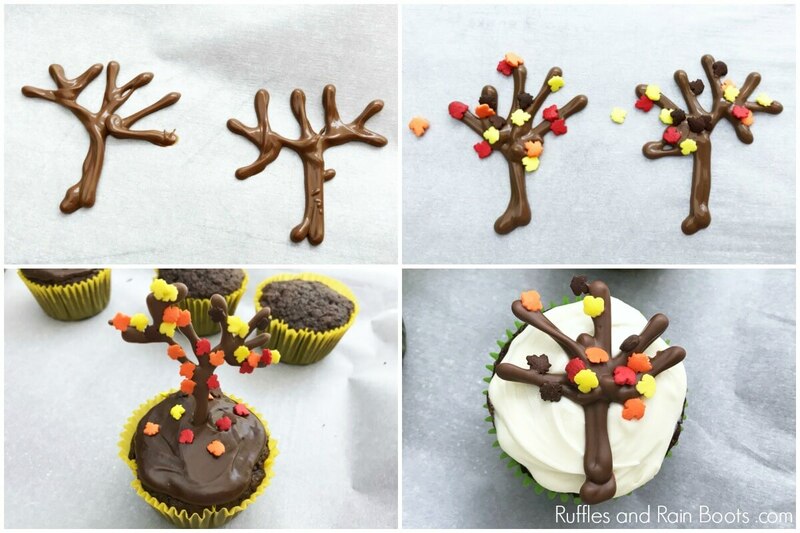 Generously frost cupcakes and insert a decoration into each of the Fall tree cupcakes. 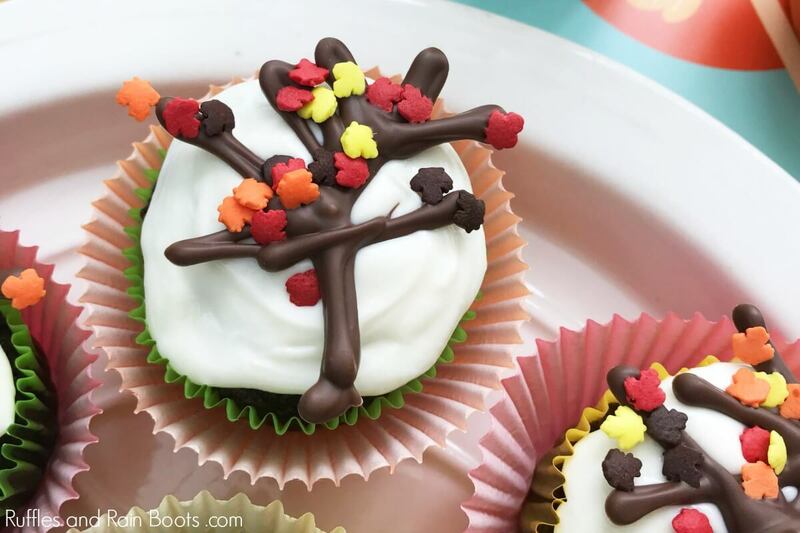 You can sprinkle a few more leaves in the frosting. Repeat for all cupcakes.